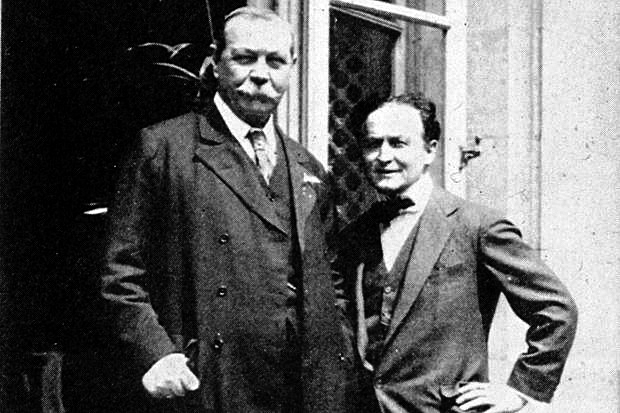 Home TV Shows Step aside Moulder & Scully, Houdini & Doyle Will Take The Case! Step aside Moulder & Scully, Houdini & Doyle Will Take The Case! Hop on the time machine as we watch supernatural cases being solved by REAL people from history. Presenting Houdini and Doyle! Houdini and Doyle is an upcoming procedural investigation drama series with a supernatural slant that presents real life friends Harry Houdini, and Sir Arthur Conan Doyle, two historical figures as they join forces to investigate crimes bordering on the paranormal. Come Harry, the game is afoot! Houdini (Michael Weston) a professional magician and escape artist believes everything unexplained is a trick, or a fraud. He’s your original Myth-Buster. Doyle (Stephen Mangan), the creator of Sherlock Holmes –the greatest fictional detective popular for his use of deduction & logic, is a passionate believer in the supernatural. Imagine a late 18th to early 19th century X-files with two iconic and truly idiosyncratic individuals at the helm of each mystery. This 10 part American-British-Canadian drama television series for Fox in the United States, ITV in the United Kingdom, and Shaw Media in Canada is from The Librarian creator David Titcher, House creator David Shore and writer-producer David Hoselton coming this spring 2016.